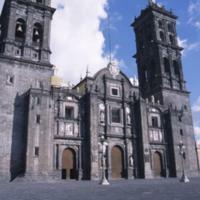 Like other cathedrals in New Spain and in Europe, Puebla’s cathedral was the product of a series of different architects. The initial plan seems to have been that of Francisco Becerra, an emigrant architect from Trujillo, Spain, who was named maestro mayor (main architect) of the Cathedral in 1575. 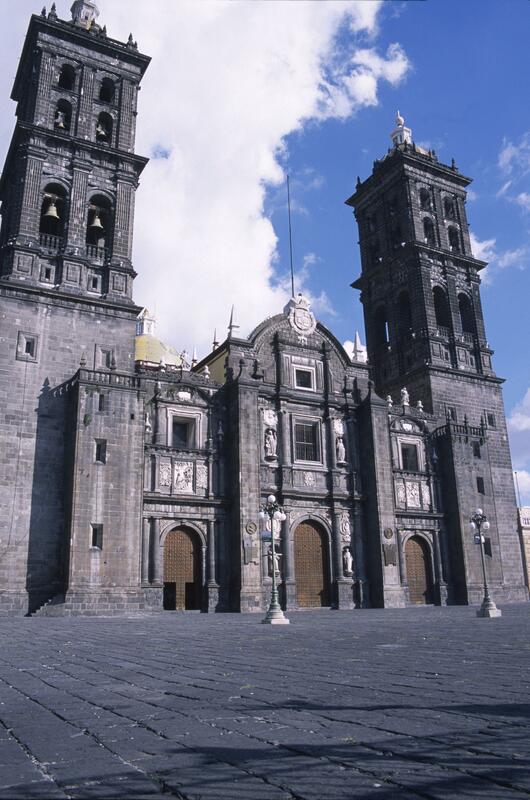 The Cathedral is the second largest in Mexico (the Mexico City Cathedral is the largest). While this building was finished in the mid-17th century, its façade follows Renaissance models of earlier decades. In important buildings such as this one, architectural conservatism often prevailed. The façade is unified by architectural orders, which were widely discussed in European architectural treatises. Doric is at bottom, Ionic in the middle and Corinthian at top. The façade was often one of the last parts of the building to be carried out. Both in Mexico City and Puebla, architects set lighter colored bas-reliefs into the façade. The one on the left features Saint Rose of Lima, whose canonization in 1671 would have been a recent event at the time final decorative elements were added to the building. The saint on the right is Saint Teresa of Avila, who was also canonized in the 17th century. The towers were the last part of the building to be finished, with the south tower not being completed until 1768. The building is made of tezontle, a local reddish colored stone. The use of tezontle and colorful glazed tiles on domes are hallmarks of Puebla architecture. While Francisco Becerra drew up the plans for this Cathedral, when left for South America in the 1580s, construction stalled. Luis Gómez de Trasmonte was called to Puebla to revise the plan around 1635. As the architect of Mexico’s city’s cathedral, Gómez de Trasmonte could update building techniques with tried-and-true methods used in the capital. His expertise was particularly essential with the building’s 39 vaults, the most complex part of any building. Other famous architects, sculptors and painters contributed works to the Cathedral, including Manuel Tolsá and Miguel Cabrera (both of whose works also appear in Vistas). A web of connections exists between major buildings 16th and 17th century buildings in Spanish America. For instance, Becerra, who designed Puebla’s cathedral, would also design Lima’s and Cuzco’s. Juan Gómez de Trasmonte would play a major role in both Mexico City’s and Puebla’s cathedrals. This may reflect how, in the 16th century, there were only a few highly skilled architects in Spanish America who could take on such complicated commissions, and most of them were trained in Europe. It also suggests that civic and religious patrons of Cathedral architecture in Spanish America sought buildings that would be modeled, at least in part, upon great Cathedrals they knew from Europe. Bérchez, J. 1992. Arquitectura mexicana de los siglos XVII y XVIII. Mexico City: Azabache. Fernández, Martha. 1990. Artificios del barroco: México y Puebla en el siglo XVII. Mexico City: Universidad Nacional Autónoma de México, Coordinación de Humanidades, 1990.
interpretaciones de la arquitectura española en América. Anales de Historia del Arte 11: 121-148. Luyando Lares, Alberto and Antonio Juárez Burgos. 1986. La catedral de Puebla; The Cathedral of Puebla; La cathédrale de Puebla. Puebla: Universidad Autónoma de Puebla, 1986.